The little things make a big difference in customer experience. In this keynote presentation, Stan shares the key ingredients of creating signature added value. We’ll cover the 12 different types of purple goldfish in the two main categories of value and maintenance. Little extras such as the importance of follow up and how to handle mistakes. As a result of this keynote session, participants will get equipped with the 3D process for customer experience, understand how to do the little things to drive value or reduce customer effort, and gain a deeper appreciation for the need to exceed customer expectations. Happy engaged employees create happy enthused customers. 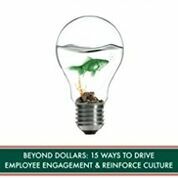 In this presentation, Stan shares the 15 types of green goldfish, little extras for employees such as onboarding, time away, team building, flexibility, recognition and empowerment. The keynote explores signature ways “beyond dollars” to drive employee engagement such as onboarding, team building, flexibility, recognition and empowerment. Attendees will walk away with the knowledge of the key drivers of employee engagement. They’ll be able to introduce actionable ideas for their teams, little things that will increase engagement, improve retention and reinforce culture. According to a recent study, 76% of customers expect brands to understand their individual needs. 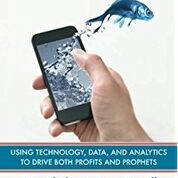 In his keynote, best-selling author and Forbes contributor Stan Phelps makes the business case for leveraging technology, data and analytics to create a competitive advantage and increased customer loyalty. He'll share cutting edge examples and insights from the Blue Goldfish Project. Get equipped with the 3 R’s to leverage technology. Purpose is changing the way we work and how customers choose business partners. By 2020, there will no longer be a distinction between for profit and non-profit companies. Businesses will either be seen as "for purpose" or "not for purpose." 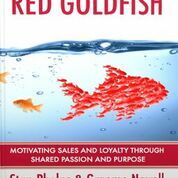 In this keynote, Stan shares lessons from the Red Goldfish Project. 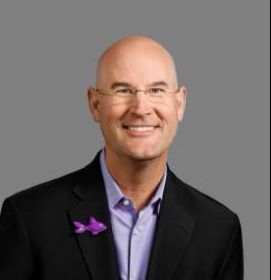 He'll share cutting edge examples and reveal the eight ways businesses can embrace purpose that drives employee engagement, fuels the bottom line and makes an impact on the lives of those it serves. Learn eight purpose archetypes and how purpose drives differentiation. True differentiation in business is rare. We are now living in an age of equivalency. Businesses need to find ways to stand out. This keynote presentation shows the seven ways to leverage what makes you unique and wonder-full in business. Get equipped with how to uncover weakness and weirdness in their DNA. Stan challenges brands to explore new opportunities, showing them how to be more successful in tomorrow's changing world. Working with clients to create keynotes and workshops that are memorable, meaningful and on-brand. 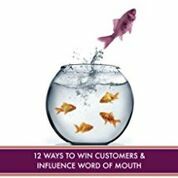 He is the author of six books, including Purple Goldfish – 12 Ways to Win Customers and Influence Word of Mouth. 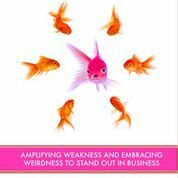 The book is based on the Purple Goldfish Project, a crowd sourcing effort that collected over 1,001 examples of signature added value. The book draws inspiration from the concept of lagniappe, providing 12 practical strategies for winning the hearts of customers and influencing positive word of mouth. 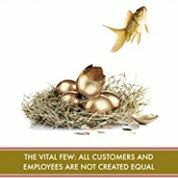 Golden Goldfish – The Vital Few: All Customers and Employees Are Not Created Equal. The Prior to focusing on speaking, Stan held leadership positions at IMG, adidas, and the PGA of America. He also spent seven years as Chief Solutions Officer at Synergy, an award winning experiential marketing agency. At Synergy, he helped create larger than life brand experiences for brands such as KFC, M&M's, Starbucks and organizations such as NASCAR, MLS, and the USTA. Stan started writing and speaking in 2009 on the belief that "differentiation via added value" can be a game changing strategy. For far too long, the overwhelming majority of marketing has fixated on the eyes and ears of the prospect. Not enough has been focused on creating experiences for current customers that drive referrals. Great customer experience is about being so remarkable that people can't help but talk about you. That if you absolutely delight someone – they will not only come back, but they'll bring their friends. He is a Past-President of the AMA Triangle, a 700+ member chapter of the American Marketing Association. He also currently serves on the Advisory Board for Special Spectators. Stan received his BS in Marketing and Human Resources from Marist College, a JD/MBA from Villanova University, and a certificate for Achieving Breakthrough Service from Harvard Business School. Stan lives in Cary, North Carolina with his wife Jennifer and two boys Thomas & James. "We booked Stan on short notice for a high-value client in 2015. Stan was extremely responsive to all our requests, coordinated closely with me and the client to customize a complex workshop. He made the content relevant to a range of working knowledge among C-level attendees, with well-selected case studies and exercises. The client was very pleased and I'd recommend him without reservation." Stan captivates audiences and delivers valuable insight in the form of engaging stories making people feel connected. He has great presence and energy and the feedback we got from his presentation was formidable. Not only did he share interesting information but the audience left inspired with new ideas for their own businesses. Inspirational, motivational - Stan kickstarts creativity for business people who want to better their business and take things to a new level. "Stan and Evan did an outstanding job getting my team to not only understand the importance of exceeding client expectations but also provided tools so we could map out our client's journeys and find the important touch points where we can give unexpected extras to surprise and delight our clients. Their presentation style is engaging, interactive, and captivating and the day-long session seemed to fly by leaving us wanting more." Stan is an inspiration. With a powerful but simple to follow message, he moves an audience to act. Few others have the power to set sights high, and yet provide a path to implement straightforward, innovative ideas when they leave the room. Attendees at my event raved, universally naming his keynote the highlight of our conference. Stan is a master storyteller who understands what it takes to develop a core of raving fan customers and build the internal team necessary to keep them coming back for more. My only regret is that we didn't book him years ago. I've never been more pleased with, nor resonated with a presentation as the one you gave to our DC Chapter. The message was clear, compelling, well-illustrated and had impact on all attendees that, I'm sure, will endure with each person for years. Stan is an amazing speaker with a unique breath for colored-fish ideas that he can summon to support a great themed public appearance. People simply loved him, loved his appearance and loved the show! Definitely a speaker to have in your roster. Stan was a fabulous entertaining speaker. His mixture of statistics, humor and original concepts made for a great presentation. THANK YOU! You were the most interactive and crowd engaging speaker that I have seen come to speak to our chapter; everyone loved your presentation! "Stan is a difference maker! Who will entertain, teach, motivate and inspire you. Plus give you the tools to make a immediate impact in your business. If your serious about improving your companies bottom line then having Stan Phelps at your next event is a MUST!" Stan speaks about the importance of connecting deeply and giving more to your customers -- and that's exactly what he delivers as a speaker. His session was inspiring, engaging and educational and exactly what we were looking for. 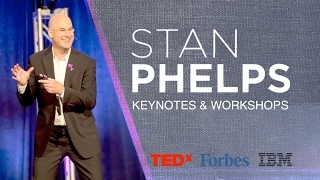 "Stan Phelps captivated our audience in Alaska with his Purple Goldfish analogy. What I enjoyed best was the framework and tools he provided that was immediately implementable to our marketing efforts. We will be booking Stan Phelps again!" Stan was a very dynamic and interesting speaker. Our attendees laughed and learned a lot. During our post-event reviews, our audience had nothing but positive things to say about Stan's presentation. "Stan has the amazing ability to make complex ideas easy to comprehend, digest and apply. His presentation style is compelling, his frameworks are practical and his applied knowledge exercises reinforced key concepts and solidified the learnings. In addition, he is an absolute pleasure to work with - a true professional!"